I've been puttering around the studio and improving things. 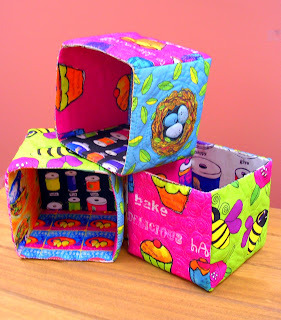 I'm working on a cover for my sewing machine and just finished these cute quilted boxes. The fabrics are all of my Spoonflower prints (all gorgeous btw). Now I've got all my miscellaneous supplies in them, which neatens up my work table. I made them each 5" so I can line them up for supplies. Your prints came out beautifully and your boxes are wonderful. Fabulous, Kelli! I'll bet every time you look at these you smile to think of the fact that the fabric is YOUR DESIGN. These are very strut your stuff-able. I love all the colors in your blog, in your work. Do these boxes have stiffener in them? They remind me of the boxes I made years ago that opened and had little drawers in them.